The other day I walked into the kitchen to find my dishwasher spewing out big, frothy suds all over the floor. Turns out, Max accidentally used regular dish soap in the dishwasher, which may or may not be because I mislabeled the container… Sure, the idea of having our own foam party in the kitchen may sound fun, but it was such a pain to clean! While I was scooping up those slimey froth-clouds however, I did start to wonder how regular dish soap and dishwasher detergent could work equally well even though one suds and the other doesn’t. Well, I did some research and it seems that foaming agents are added to common detergents purely as a marketing strategy, since bubbles have a reputation for signifying cleaning capabilities. There is some correlation between amount of bubbles and detergent concentration, which does affect how clean things get, but there is no correlation between amount of bubbles and cleaning powers. The dish soap and dishwasher soap is a perfect example of this. Soaps and detergents, are similar in that they both clean stuff, but soap derives from natural sources and does produce bubbles as part of its cleaning capabilities. Detergents, on the other hand, are made synthetically and don’t require any suds at all to work. Some of the common foaming agents added in for purely aesthetic reasons are sodium lauryl sulfate (SLS) and other similar sounding chemicals. These foaming agents are found in everything from toothpaste, to shampoo, to dish soap, to home cleaning products. The reason SLS and similar chemicals should not be used are many, including the fact that it is a well-documented skin irritant, studies show it has the capacity to permeate and bioaccumulate into our bodies, the manufacturing process is highly polluting, and it gets into groundwater, affecting aquatic life and the the water we drink. Luckily, around the same time of my dishwasher fiasco, my friend’s mom shared her own, all natural, easy, and lovely-smelling dish soap. Boil the lemons in water until soft (easily punctured with a fork, like boiled potatoes), then use a stick or regular blender to blend it all together until creamy. Transfer the blend back on the stove and add in the salt and vinegar. Bring the mixture to boiling point for 2-3 more minutes while frequently stirring, then turn off the heat. Once it is cool, you can transfer the mixture into a regular (or repurposed) dish soap dispenser and use it just like the regular stuff. As long as you keep it out of direct sunlight and away from heat, it should actually last months (I’m not sure how long yet because the batch I made about 2 months ago is still fine). First of all, the fresh, lemony scent will instantly put you in a good mood, and knowing you’re actually cleaning with the power of lemons is an awesome feeling. Secondly, it mostly has to do with the acid and salt concentration. I talk about the awesome cleaning and disinfecting properties of citric acid here, but basically it is a great cleaning agent, especially for those of us who have hard water. The salt and vinegar contribute to cleaning, and the lemon properties and oils are what cut the grease on dirty dishes. Where else can you use this cleaner? I use it in my dishwasher too, the only difference with the regular stuff is that I fill up the detergent compartment to the brim beyond the suggested level and it seems to work fine. 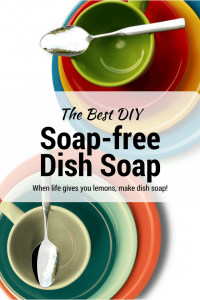 I will admit that if I made an extra-greasy meal and need some extra ‘oomph’ to the washing, I’ll add literally 3-4 drops of regular dish soap or about 1/2 tablespoon of dishwasher detergent, but 90% of the time the homemade lemon cleaner is enough. 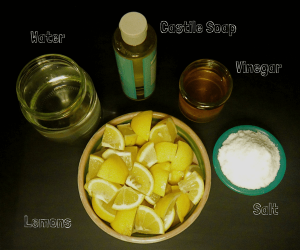 Make sure to also check out my post for a descaling all-purpose cleaner using similar ingredients! Hi there! Looks like a great recipe, but I am a bit confused. You show castille soap in the photo and a link to buy it, but it doesn’t seem to be included in the recipe. Am I missing it? Please clarify, because I can’t wait tpo try it! Good catch Chanell! 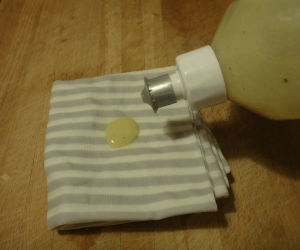 Actually the reason is that I took the pictures before I fully tested the recipe 🙂 Castile soap (which is a fairly strong base) does not mix well with acidic ingredients, so even though I included it in the first couple tries, it should not be a part of this recipe. In other words, my apologies, castile soap should not be included in this post. I will change the images as soon as I get a chance- thanks for the comment.